So, remember how we took away Little MPB’s soother? I’ve been waiting on edge for a horrible night, but we still haven’t had one. He continues to sleep through the night, which is pretty amazing. And, more surprisingly, instead of the horrible sleepless nights I’ve been expecting, he has developed 2 new habits. Thankfully, these habits are completely adorable! First, he now wakes up talking to himself. Before he had a literal plug in his mouth so he never woke up talking, he’d wake up and cry for us or cry for the soother that had fallen out of his crib. And sometimes he’d wake up and just play contently in his crib – we adults liked those mornings. Now, we lie in bed listening to his conversations with himself. Seriously, they are adorable! Or at least, what we can hear is adorable. Sometimes we still hear about Marshall. Sometimes he has adorable little conversations with his stuffed animals. And sometimes we have absolutely no idea what he is saying, but the gibberish is still plenty cute. Second, every morning after we lift him out of his crib, he begins searching his room for a soother. He’s not upset, he’s just searching. He get’s down on his hands and knees, looks under his crib, just incase one fell out of his crib at night. When he doesn’t find one he turns to me and says All Gone! I simply say Yup, all gone. And then he looks again, just to be sure and re-states All Gone! while nodding his head. He then proceeds with his regular morning antics. I have to say, I’m thrilled with these adorable little developments that are a direct result of getting ride of the soother! They are SO much better then all the horrible things I assumed we’d encounter. That’s adorable! One of my favorites things to do is listen to Luke on the monitor when he gets up. He’s just happily chatting away! Also, way to go on sleeping! Keep it up little MPB! It really is adorable to listen to them, eh? Like Luke, Little MPB is just so happy too. Does Luke have a favourite stuffed animal or blanket that he sleeps with and then talks to in the morning? Oh man does he! He has two bears in his crib and a blanket. He’s also been asking to sleep with books and will often “read” himself and book before nap and upon waking. Just today he also wanted to sleep with two of his little wooden cars. This little guys are so funny! 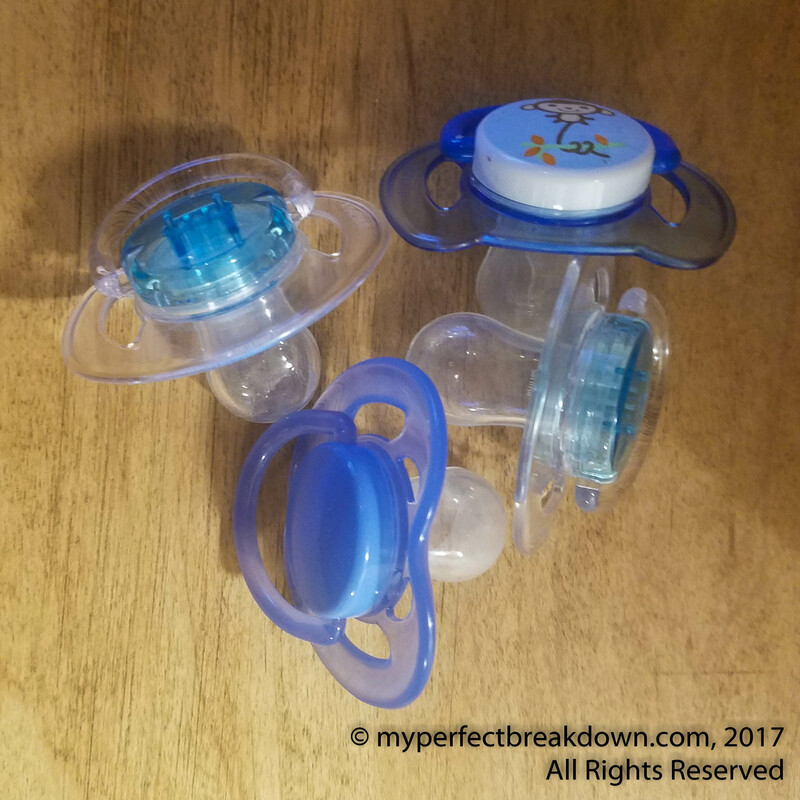 I’m so happy to hear that the soother was easy to drop! Love it! Cadence talks to herself when she wakes up, too. I’m so glad he’s doing so well without them! You guys are so brave! I think A will have here til Kindergarten for fear of the tantrums, lol. There is nothing cuter than a happy baby (in footy pjs) first thing in the AM! Adorable!